Hello everyone! Are you keeping up with all the challenges? Don't worry, you have plenty of time so have fun! It's Laura here, and I have a sketch challenge for you! I don't often make up sketches, but I sure do love to work with them, and I hope you do too! Here's my sketch. And here's my take on it! CHALLENGE: Create a card using the sketch! So simple! 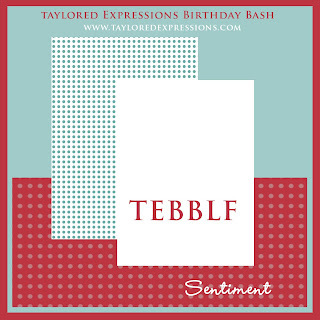 You’re not required to use Taylored Expressions images for our challenges. KEYWORD: Upload your creation to your blog or online gallery (or both). 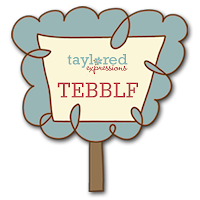 If you’re uploading to online galleries, use the keyword TEBBLF. Then come back to this challenge and leave a comment with a direct link to your creation! In order to be eligible for the prizes, you must leave a comment with a link to your card by midnight PST Wednesday, September 9th. That's it...so simple! Have fun creating and make sure you come back and share it with us all! Love da card sug! Hope you enjoy my take on your sketch!! LOVE your sketch and sample Laura! Can I make a LO or does it HAVE to be a card? Great sketch! I had a lot of fun with this card! Thanks! Here's mine, Laura! LOVED it! I simply loved this sketch! Thank you so much for hosting such a great challenge! LOVED this sketch! Here is my sketch card (combined with some of the other challenges!) THANKS! Thanks for the great sketch Laura - such a great party with fabulous challenges! Thanks for being a hostess!! So fun! Love this sketch! WOW!! Amazing work everyone! I'm so happy you all had time to play along with the challenges! I just wanted to leave a quick reply to Tanya's question! Yes...your creation can be a layout! That would be fabulous! Great sketch- Here's my take. 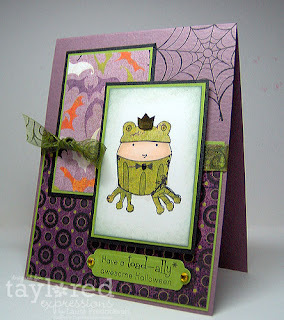 I love your little froggy card. Soo cute! Great sketch challenge. Here is my card. Hi Laura, What a great sketch. I turned it sideways for my card and the link is below. Thanks so much. Laura this was such a great sketch I am so happy I was able to play along! Laura I just love the cupcake girl's costume! I think that my DGD would look so cute in this. The sketch was a delight. Thanks for the challenge. Here is my card (and my daughter's too) . . .